Most of us love our dogs unconditionally, but a good bath will make cuddle time and cohabiting with them much more pleasant. Though they may dread bath time, it’s crucial that we give them a good wash to help keep them looking healthy and clean. But before you head out and start bargain hunting for the cheapest dog shampoo, you should know that every dog shampoo is formulated to explicitly tackle certain problem areas that your dog may be facing. 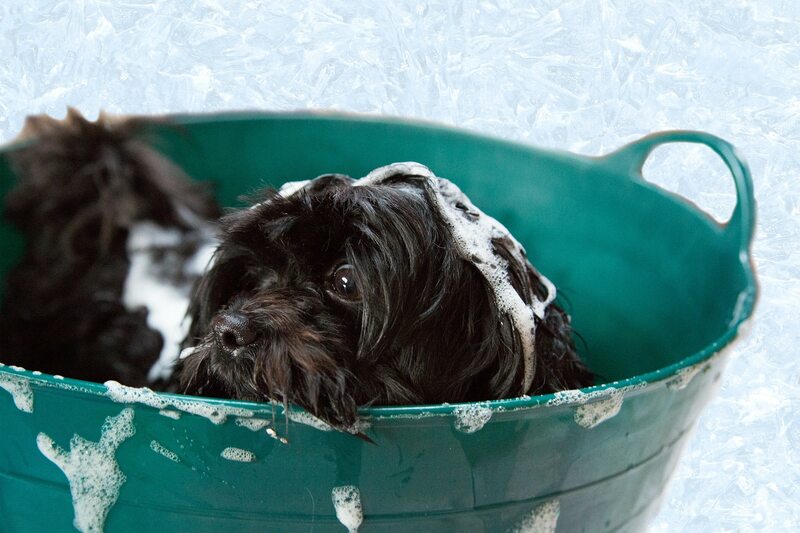 Find out which shampoo will get the job done for your dog from the list below. If you notice that your dog is constantly scratching itself, the last thing that it needs is a bath with harsh chemicals. It might even be a sign that it is time you check out the Earthbath Oatmeal & Aloe Shampoo. The all-natural formulation of this shampoo ensures that none of your dog’s natural oils are stripped away. The combination of oatmeal and aloe will also help to relieve itchy parts on your dog’s skin while providing it with the much-needed moisture on its skin and hair. Richard’s Organics Flea & Tick Shampoo is a safe and natural option to repel pesky fleas, ticks and even mosquitoes that prey on our four-legged buddies without the use of harsh chemicals. It’s made up of five essential oils that will leave your dog smelling fresh. These oils also exhibit anti-microbial and anti-fungal properties to treat inflammation and irritation. If your dog has an overgrowth of yeast on its skin, then it’s time for some disinfecting with the Dermcare Malaseb Medicated Shampoo. This shampoo contains Chlorhexidine Gluconate which is an antimicrobial agent that’s capable of fighting against gram-positive and gram-negative bacteria. To tackle the fungi and yeast growth, Miconazole is an ingredient found in the shampoo that’s perfect for the job due to its antifungal nature. The Virbac Epi-Soothe Shampoo will be your saving grace if you have a dog that has sensitive skin. Its formulation includes colloidal oatmeal which is great for soothing and cleaning dry, sensitive skin. The addition of spherulites in the mix allows for a sustained release of the colloidal oatmeal and other moisturising ingredients onto the skin and coat, to prolong their effects after application. The shampoo also contains chitosanide which helps to form a protective layer on your dog’s skin and reduce dryness. Shedding is a natural process for dogs, but you should be alarmed if your dog’s hair is thinning to the point that you can see its skin. It’s time to take matters into your own hands with the SynergyLabs Shed-X Shed Control Shampoo. This shampoo is specially formulated to control excess shedding while also removing any loose fur without interfering with existing flea and tick treatments. The Shed-X also infuses the skin with essential amino acids to help strengthen and moisturize your dog’s skin and coat. The VetBioTek C4 shampoo is your go-to shampoo if you happen to own a dog that has moderate skin conditions and responds well to chlorhexidine treatments. It contains ceramide III to help in restoring the lipid barrier of your dog’s skin, making it both healthy and hydrated. The C4 shampoo features not only a pleasant scent but also special conditioners to leave your dog with a healthy, clean, and shiny coat. As a pet parent, it’s not fun seeing your dog compulsively scratching itself because of its itchy skin. That’s where the Pro-Sense Itch Relief Hydrocortisone Shampoo comes in. The hydrocortisone content in the shampoo’s formulation helps to alleviate itching and stop your dog from scratching affected areas. Don’t worry about your dog wincing in discomfort. This shampoo does not contain any alcohol and features aloe vera as an ingredient instead, so it is very soothing to the skin. Once your dog has taken a bath with the Aroma Paws Coconut Papaya Shampoo & Conditioner, get ready for some sweet-smelling cuddles with your dog. The formulation contains coconut oil which acts as a natural moisturizer while papaya extracts work to thoroughly condition your dog’s skin and coat. The shampoo contains a blend of fresh Hawaiian papaya, seagrass and seaweed extracts to give off the scent of the fresh outdoors. Just like humans, dogs are prone to getting dandruff. To treat this, you should opt for the PETdiatric Cluve Meddice Skin Tech. It contains salicylic acid that is used primarily to exfoliate the skin to slough away dry “doggie dandruff” and wash off excess oils on the skin. The Cluve Meddice Skin Tech is also formulated to suppress irritation symptoms to provide your dog with relief from the itch. The SynergyLabs Veterinary Formula Antiseptic & Antifungal Shampoo is your go-to choice if you are looking to treat your pet’s skin allergy. It contains a combination of benzethonium chloride and ketoconazole to treat bacterial pyoderma and allergic dermatitis in dogs. Don’t worry if your dog has sensitive skin or predisposed allergies. This shampoo is a gentle coconut oil-based cleanser and contains no harsh ingredients to provide your dog with long-lasting comfort. If you suspect that your dog might be suffering from mange, it’s time to bring out the Dinos Medicated Sulfur Shampoo. It contains sulfur as an active ingredient and is also one of the best ingredients to kill pesky sarcoptic mites that have made their home on your dog’s skin. Besides that, the sulfur also exhibits antifungal and antibacterial properties to help prevent and control common skin disorders.